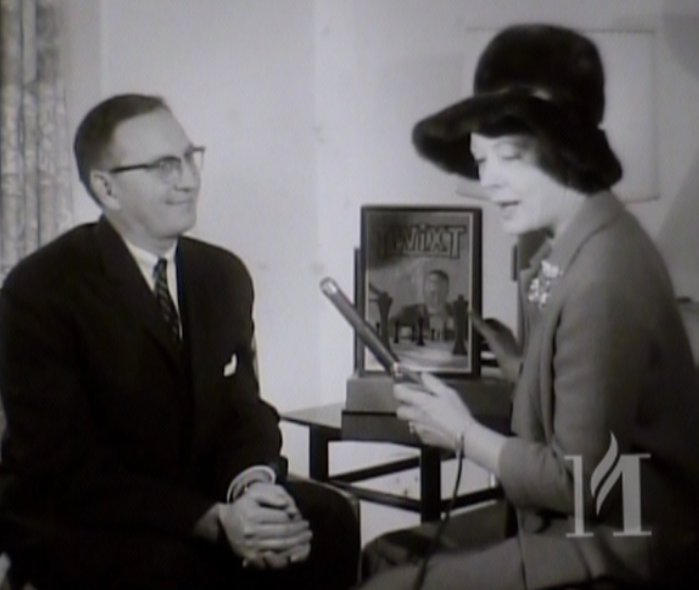 This TV interview was found at the MHS museum on a celluloid film roll. The copyrights of this film are at the MHS(St.Paul), so I can´t publish the original material here. With the help of Paul, who is living in St. Paul, I got a copy of this film by the media duplication service at the MHS. This film doesn´t reveal any new secrets, but it gives a nice insight to the intention of 3M management in the 60´s. Again with the help of Paul we generated a complete transcript of the interview, which I publish here. 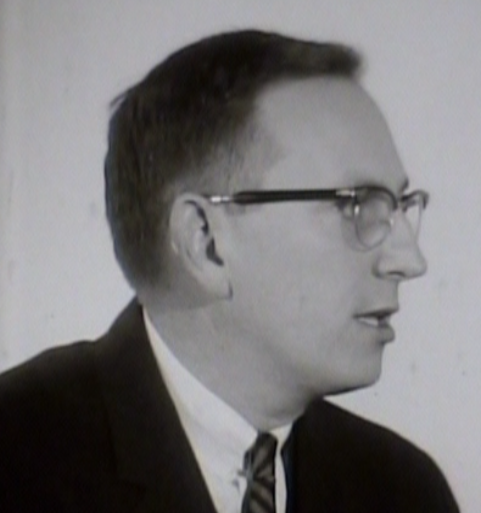 Enjoy this about 50 years old interview! Interviewer: Bill, how did you get into the type of fun job you have where you play a thousand games a year, approximately? Now, something must have started this off. Bill Caruson: Well, I happen to be fortunate enough to work for a growth company, Minnesota Mining and Manufacturing Company, and three years ago we did some checking into the “leisure time” field and found that the growth of the boxed game, or strategic boxed game market, was increasing at a rate of about eight percent compounded annually, so we decided to take a flyer in this field. And, of course, I was working in the New Products Division at the time, so they threw the ball to me. I: And you got into playing games. I: What do you think is the reason for the growth in people actually taking time to sit down and work out a game? C: Well, I think people today have more leisure time, plus the fact that I think television has been somewhat instrumental. For the first time people have family rooms being added to their homes, and this was brought about by the TV set. But now that people have these beautiful family rooms, they’re looking for more things to do than just play television. And...uh…they have games and dart boards, and…among other things. I: It wouldn’t be because there are more senior citizens, would it? C: -- contribute to it, right. Right. Many more people. I; Um, these games that you speak of, that you are introducing, they are geared for adults? Or are they geared for children? C: Well, primarily adults. However, they are two-leveled games. They can also be played, and enjoyed, on another level by, let’s say, 10- and 11-year-olds on up. I: I see. Is there anything educational about them? C: Yes, well, I think any game, uh, strategic games such as ours are also educational, however we don’t like to punch that home too…too much. I: That might kill a sale. I: If it’s good for you or if it’s educational, it might kill a sale. C: That’s right. People like to be entertained. I: Yes, they do. I’m particularly interested in one – of course I’m reaching away to the back for it – because I believe this is…um…an import. No – I was looking at Acquire. Well, now Acquire is from the world of high finance. Will this teach someone how to buy stocks and bonds? C: I think it would give them a basic idea as [to] how stocks operate. For instance, the players themselves control the growth of the stock in this game. There are 108 squares and 108 corresponding tiles, and the people that play the game control the growth of the companies on the board itself. And as the companies grow in size, the stock goes up in value, so I think from that basic standpoint they can see how big businesses operate and how the growth pattern would actually increase the value of the stocks themselves. I: You know this, Bill, would be a good father-and-son game. Well now I’m looking for the one that I believe you imported from Africa. Which one is that? C: That would be Oh-Wah-Ree, actually. I: O-R-E? What does that mean? I: Well now, how did you acquire this game and modernize it, so that we know what we’re playing? C: Well, actually this was submitted to us by a professional game inventor, a gentleman who lives in Italy. And he has done quite extensive research in some of these board games that are played around the world. I: This brings another question to mind right away: where do you get all these games? Do you think most of them up? Do you plan them? Work them out? C: Well, uh…no, we innovate, but most of them are submitted to us by game inventors. Not necessarily professionals, but just average people who have an idea, and they think it would be a good one to market, and they send them in to us. I: Well, then, that brings another thought to mind, Bill: suppose someone watching tonight had a game they played, maybe inherited the game from their great grandmother or something – would you be interested in looking it over? I: But how long does the patent…um…hold, or protect…? C: Well, actually most games are copyrighted. And a copyright lasts for 27 years, and they can have this renewed, of course. But what they’re actually protecting would be the instructions, that is, the instructions on how the game actually is played. I: Uh, have people…um…do you feel, progressed away from the sweet simplicities of life -- and I say it that way deliberately – where, at the fire hall we used to love to play a good old game of checkers, and maybe people who were in the professional field loved to play chess. Is there a field….um…a group of people in that area, between those two areas, that like these type of games? I: [laughing] Just don’t get so personal, Bill! C: [laughing] No, I…no offense. We, uh…most people like to play games whose outcome would be determined by the use of dice or a spinner. These are games of chance. I: These are the most popular? C: -- a certain amount of luck. C: Yes, well this, I would say…the majority of the people enjoy a game of this type from just an entertainment standpoint. However, I think there are more and more challenges today that people meet in everyday life, and in their jobs and so forth, and in order to broaden themselves, it’s fun to get involved in a thought-provoking game. I: Uh, yes it is. And another thing, it’s a change of pace from the daily grind, and the “Bad Day at Black Rock,” so to speak. And you sit down and you really do exercise and yet relax your mind, don’t you? Of course, you have one game I just have to take up -- I’ll let you in on a secret, and that’s this spelling: I type so fast and my typing is so bad, no one can read it. So this one is called “The Phlounder,” and it’s a fast-moving word game that’s – well, you have to know how to spell to play it, don’t you? C: Yes, indeed you do. Actually this is a different type of spelling game because it’s an action spelling game. Everyone is racing at the same time to spell a word, and the first one that spells a word that is predetermined – it could be a seven-letter noun – would ring the bell, and that’s the end of round one. And you get points for ringing the bell and spelling the word. It’s really a fast-moving, fun game. I: [chuckling] Unless you’re playing with me, and I can just see how I’d hold up the game while I spelled C-A-T cat and D-O-G dog! Uh, Bill, Twixt – is this the one that’s sort of like a modern chess game? I: On the order of chess? C: It’s between checkers and chess. Actually, unlike chess, there is only one move that has to be mastered in the play of Twixt, so it’s easy to learn. However, after you have played it, it takes long hours to master all of the possible moves. This is a great game for people of all ages, really. It’s a good two-man game, and it’s very, very strategic. I: Uh, Bill, in playing a thousand games a year – and there’s only 365 days out of the year – how do you work this? Who do you play with? Do you sit in a little room all by yourself and work it out, or do you have a partner? Or do you take it home? Is this your homework? C: Well, actually it’s both. I play games during the day. We don’t play each game all the way through. We can screen them rather rapidly. We know what we’re looking for and we take -- let’s say, we eliminate the games of chance. And then we take the games that we think that we’re interested in, and we have a panel of college students. We actually pay them $1.50 an hour to play games during – [audio cuts out briefly] – as a matter of fact I’m getting ready for a group this Christmas. I: And how are these college students selected? I: Do you have any in Michigan? I: Are you looking for any? C: Well, this – maybe after today we will. I: Well, it would be fun to play games, to play the big 3M games. Certainly they are very challenging, uh, in reading about them. It does make you wonder – it’s been a long time since I’ve played anything short of…maybe a little Canasta. And cards, I suppose…do you have a card game? C: -- test marketed now. Yes indeed. I: We’ll be able to tell who’s the next president? C: Well, uh, among the people that are playing the game you’ll be able to tell, but whether they want to run nationally would be another thing. I: [laughs] Well, it sounds like fun. And I imagine that under many a Christmas tree there will be these games, because don’t you honestly believe now, deep down in your heart, that dad and mom buy games for the children that they can play later? C: I believe this is true. I: I think it’s true, too, and if it makes for family groups getting together, I’m all for it. I: How, just how do you establish this procedure? I’ve often been curious about this. You know, people wash products with something and all this bit, now how do you do it with games? I: Yes, I understand that. C: …and then we test-market them in, let’s say, a half a dozen cities across the country. And we include in with the games what we call a “bounce back coupon.” And if the customer that buys the game from the store sends us their name and address, we send them a questionnaire along with a gift. And then they in turn tell us what they think of the game after they have purchased it. I: What are some of the letters you’ve gotten? Are there any funny ones or any disastrous ones you can think of? I: Um, well, fun and games! That’s the business you’re in, Bill. Bill, is there any difference, taking the United States alone – is there any difference, any area, where one game or one type of game is more popular than another? C: Well, I think the most prevalent thing that is known is the Midwest is considered the “Bridge Belt,” and there are probably more people playing Bridge through the Midwest than any other part of the country. Other than that, it’s fairly widely scattered. I: It is. You say that you have college people working with you. Are college people and late teenagers a little more serious-minded than they used to be? They must be. C: Well, I think this is true because certainly the sale of strategic games to this age group has increased as opposed to the sales of yesterday. I: Well, these are sort of in keeping with the Atomic Age in which we live, when you realize -- you take a look at the toys that are being offered for Christmas -- I don’t call them toys; they look like miniature wars that are going on. I: You know, almost too realistic. If the little men from Mars buy these Christmas toys, they’ll be able to manufacture their own war equipment. However this is not on that manner of game; this is not warlike in any way. C: No. No, none of them are. I: And these are available in Hudson’s [Department Store]? C: Yes they are in the stationery department on the main floor of Hudson’s. I: Oh, I know it well. Bill, I want to thank you for being here and bringing us some very interesting information about a, well I guess a world that I never really – it’s a different world, isn’t it? I: I never really thought about it before. We don’t always take time to wonder about the background of the game we play, or the car we drive, or the hat we wear, or whatever -- all that goes into it. C: Somebody has to play the games before they’re put on the market, and that’s my job. I: Well, you’re pretty lucky to have a job that you play games at. Not all of us can say that. C: Oh, I enjoy it very much. I: I think you do. Where do you come from originally? C: Actually, my home is St. Paul, Minnesota, the home of 3M. I: Oh, it is! Uh-huh. And did you study for anything particular in college that would gear you into this? C: Well, I played a lot of games, if that’s what you mean [laughs]. I: You know, I just can’t get you off the games. I thought maybe you were a professor or, you know, a student of some particular faction that would gear you into this – because you have to have a scientific mind now, Bill. C: Well, I don’t know about that. I did major in Art and Journalism, which possibly has helped me to some extent. I: Well, it sounds like fun. And happy holidays, Merry Christmas, and keep on having fun playing games for a living. It sounds great. C: Thank you, Mary, and Merry Christmas to you, too. I: Thank you, Bill Caruson.